Music Web International, June 2013: "From the first entry of Berit Norbakken Solset’s solo in the Ave Maria I was hooked, and I hope you will be too". The cause of mirages as well as rainbows, refraction is an optical phenomenon which under certain circumstances allows us to see objects that are actually hidden behind the horizon – distant islands across a wide sea, or the sun before it has actually risen. The reason is that rays of light change direction as they pass from one layer of the atmosphere into another, or from one medium, such as air, into another, such as water. The same principle applies to sound waves, and in a sense one might say that music in the early 20th century did pass from one medium to another, from late Romanticism into an unknown future. 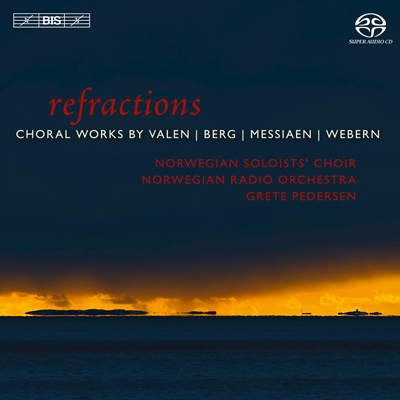 Refractions allows us to sample that transition in the field of choral music, through the prisms of four different temperaments – those of Alban Berg, Anton Webern and the Norwegian composer Fartein Valen, all born in the mid-1880s, and of the somewhat younger Olivier Messiaen. A number of the works are on sacred themes – including those by Valen – while others are at least nominally secular, although a spiritual dimension is often present. One instance of this is the celebrated Cinq rechants for twelve mixed voices, Messiaen’s fascinating musical expression of the Tristan myth in which love crosses the border between life and death – a mystical power that cannot be expressed in words.